A start-up company co-founded by UNC Lineberger researcher Andrew Wang, MD, has raised $2.9 million to commercialize a test designed to capture cancer cells circulating in the blood. 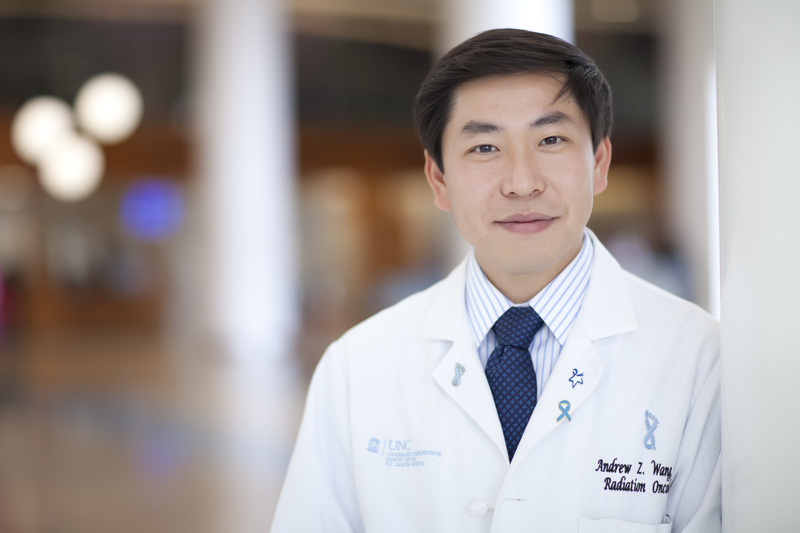 Andrew Wang, MD, is a UNC Lineberger member and associate professor in the UNC School of Medicine Department of Radiation Oncology. A start-up company co-founded by a University of North Carolina Lineberger Comprehensive Cancer Center researcher has raised its first private investment to commercialize a test designed to detect and capture tumor cells (circulating tumor cells, or CTCs) in the blood. Andrew Wang, MD, a UNC Lineberger member and associate professor in the UNC School of Medicine Department of Radiation Oncology, co-founded Capio Biosciences, Inc., to develop the test in collaboration with Seungpyo Hong, PhD, a professor at the University of Wisconsin-Madison. Wang led early clinical studies at UNC that showed that the potential test, the Oncosense CTC, can detect tumor cells with sensitivity and specificity in head and neck cancer. Importantly, they found that the CTCs correlated with treatment response. Wang co-founded the company in 2013 with Hong, who was then an associate professor at the University of Illinois at Chicago College of Pharmacy. Hong led research into the potential test’s design, and Wang led work to clinically translate the technology. UNC-Chapel Hill is the joint owner of a patent application licensed to Capio. Madison, Wisconsin,-based Capio has raised $2.9 million of what the co-founders said is a $4.5 million total planned investment. Wang said they plan to use the funds to optimize the device for commercialization, and to design a production process for the chip and an automated machine that can interpret the test results. The first installment of the investment was led by Betta Pharma of China. “We were successful in raising funding and moving this company forward because of the innovation culture at UNC and at UNC Lineberger,” Wang said. The researchers had to overcome a particular challenge when designing the test, Wang explained. Specifically, they had to capture tiny numbers of cancer cells circulating in the blood. Wang said the design of the Oncosense CTC directs the flow of blood through tiny channels. The channels walls are coated with a “sticky” substance that causes the cells to roll and slow down. They then capture the tumor cells using nanoparticles that have a special structure optimized to hold on to the tumor cells that bind to specific molecules. Wang led a pilot study at the N.C. Cancer Hospital to gauge patients’ response to radiation treatment or radiation plus chemotherapy using the test. They reported at the 2016 American Association for Cancer Research’s Annual Meeting they found circulating tumor cells in 35 patients with head and neck cancer prior to radiation treatment with the test. When they measured circulating tumor cell levels after treatment, they found lower levels in most patients. In 25 patients who had sequential measurements of tumor cells, they found that the median number of tumor cells in the blood was 71 before treatment, and 32 after. In five patients with residual disease or metastatic disease, they reported increases in circulating tumor cells. Their results suggested that the way tumor cell numbers change with treatment may predict which patients are unlikely to be cured with standard treatment, Wang said. “Our ultimate goal is to make this device a highly reliable biomarker of many cancers that will help with treatment decisions, personalized medicine, and that will help reduce health care costs,” he said.